The stunning, 95-mile long Strait of Juan de Fuca is divided distinctly in half; the international border between Vancouver Island, in British Columbia, Canada, and the Olympic Peninsula in Washington State, USA, is drawn down its center. In 2008, Chemainus First Nation in Canada proposed the name be changed to Salish Sea. Initially met with a positive public response, the request went through a lengthy bureaucratic process that involved different government departments in both the USA and Canada. Eventually, it was decided the Strait of Juan de Fuca would keep its name; however, the Salish Sea would be used to describe the entire area, which stretches from Desolation Sound south through the Strait of Georgia and Puget Sound to Hammersley Inlet. On the Canadian side, the Juan de Fuca Marine Trail stretches 47 kilometers between China and Botanical Beaches. Aside from stunning coastal scenery, this entire hike is lined with plenty of beaches that offer outstanding – albeit, absolutely freezing – surf breaks. 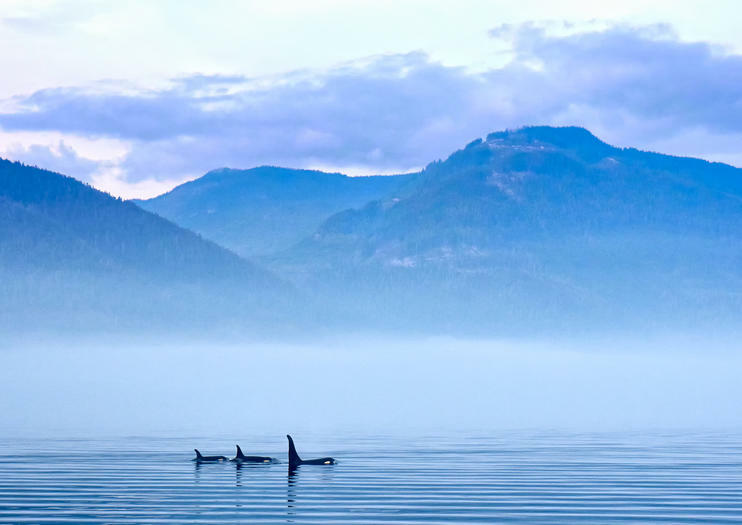 Pods of resident Orcas call the strait home, so whale-watching is popular from April to October. Along with killer whales, it’s common to see humpback, minke, and grey whales, seals, sea lions and porpoises, depending on the season. Discover the native marine wildlife for which British Columbia is famous on this 3-hour bird and sea lion-watching tour from Victoria. Hop aboard your high-speed Zodiac vessel in Victoria and head out onto the Strait of Juan de Fuca’s rolling waves with your guide. Watch the water for possible sightings of graceful whales and porpoises, and gaze over the rocky coastline where playful seals and sea lions relax. Watch the skies for bald eagles, heron and other native bird life, and gain insight into the animals’ life cycles and hunting habits.